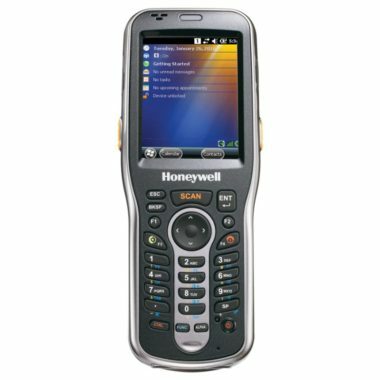 A smart, pocket-sized device - this is the Honeywell Dolphin 6110 handheld computer. With this device, it is easy to optimize your in-house operations and thus increase the productivity of your company. versatile: warehouse management, customer care, price inquiry etc. The Honeywell Dolphin 6110 with its compact design and slim keyboard, is a mobile computer which you can actually be operated with just one hand. It also offers many features such as imagers to capture 1D and 2D barcodes, Adaptus 6.0 also allows digital image and signature capture. Voice-over-IP (VoIP), as well as push-to-talk (PTT) are used for mobile voice communication. Wireless real-time data communication with advanced security standards is ensured by 802.11 a/b/g/n. There are 2 operating systems available: Windows CE 6.0 and Windows Embedded Handheld 6.5. The Dolphin 6110 from Honeywell makes workflows more smooth. It is very stable and is even suitable for light industrial environments, as it is resistant to dust, dirt and splash water (IP54), and it can withstand several drops on concrete without impairing its functionality. The battery life exceeds a work shift even in scan-intensive activities, saving time-consuming loading while you work. The Honeywell Dolphin 6110 provides a fluid workflow in your business and is an investment that pays off.